Treasures from ancient Egypt and East Asia will go on show to the public from Friday. National Museum: Has been restored to its former glory (file pic). 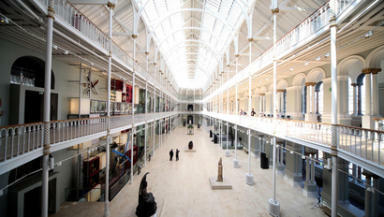 Galleries showcasing treasures from ancient Egypt and East Asia are set to open as the National Museum of Scotland's £80m transformation is completed. The 15-year project has returned the Victorian building in Edinburgh to its former glory, creating new public spaces and revealing more items from the national collections, many of which had not previously been on display. Three new galleries - Ancient Egypt Rediscovered, Exploring East Asia and the Art of Ceramics - open to the public on February 8, completing the final phase of the transformation. More than 1300 objects have been selected for the galleries and 40% of the items are going on display for the first time in generations. Bruce Minto, chairman of National Museums Scotland (NMS), said: "This is a truly historic moment in the life of a great museum. The transformation of this iconic Victorian building on time and on budget is an achievement of which the nation can be rightly proud. "Our outstanding collections help us to tell a vast range of diverse and fascinating stories from across the globe, highlighting the many Scots involved in invention, innovation and discovery. "These stories have engaged our many supporters who have given generously to help us achieve our ambitions and to whom I am extremely grateful." The Ancient Egypt Rediscovered gallery explores how the civilisation evolved across more than 4000 years of history. NMS said highlights include the only intact royal burial group outside of Egypt, the only double coffin ever discovered in Egypt and a decorative box of King Amenhotep II. The cultures of China, Japan and Korea are celebrated in the Exploring East Asia gallery, where outstanding objects include a Chinese lacquerware rice measure from the Ming dynasty, samurai armour and a "rare and important" Korean lotus-shaped cup and stand from the 13th century. The Art of Ceramics gallery shows pieces from across the world over a long time period, from the 19th century BC to the 21st century AD. Among the objects on display are a 16th century Maiolica dish featuring a donkey playing a lute, an ancient Greek vase decorated with wrestlers dating to circa 475 - 450 BC, and a porcelain alcohol ewer from the Qing dynasty. Dr Gordon Rintoul, director of NMS, said: "Over the past 15 years we have worked tirelessly to transform this wonderful building, to rediscover our extensive and outstanding collections and to create fresh and inspirational visitor experiences. "The result is the creation of a world-class museum for the enjoyment of national and international visitors today and for many generations to come." This £3.6m phase of the transformation project was made possible with support from The National Lottery Heritage Fund, The Wolfson Foundation, the Sir James Miller Edinburgh Trust, the Garfield Weston Foundation, The Negaunee Foundation and a community of trusts and individual donors.